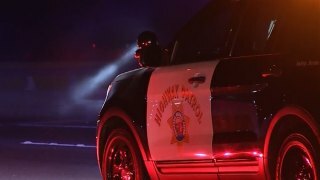 Authorities say a person plunged 50 feet from an elevated California freeway off-ramp during an illegal demonstration of car stunts. The San Francisco Chronicle reports California Highway Patrol Officer Sean Wilkenfeld says the show was reported just before midnight Saturday on the Interstate 80 on- and off-ramps for Crockett. Responding authorities found about 100 cars and 300 people. Wilkenfeld says cars were parked along the ramps and fireworks were being set off. Wilkenfeld says one person fell or jumped from the westbound on-ramp to a street below. A medical helicopter was called to take the victim to a hospital. Neither the California Highway Patrol nor the Crockett-Carquinez Fire Department could provide information on the victim's condition, the nature of the injuries, or whether the person jumped or fell. Officers issued multiple citations and seized at least one car.